UFC 234 has been hit with a devastating blow, just hours before it’s set to begin, as it’s being reported headliner Robert Whitaker has been forced to withdraw. The middleweight champion, who was booked to fight Kelvin Gastelum, has reportedly been diagnosed with a hernia and will need to undergo surgery. The news was relayed to ESPN’s Brett Okamato via UFC President Dana White. 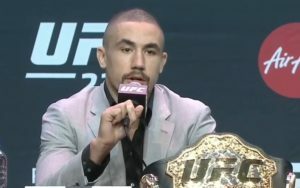 Whittaker started complaining of pain in his abdomen region last night, and the hernia was subsequently discovered by doctors. The middleweight fight between Israel Adesanya and Anderson Silva will serve as the main event. The contest will remain three rounds.